Every year on the first May bank holiday, our town becomes over-run with pirates. We’ve managed to (unintentionally) miss the fun over the past couple of years that we’ve been here, but this weekend we had no excuse so we bundled up our sleepy teething baby and wandered down to the harbour to see what was going on. First step was to fashion Arthur a costume: it’s amazing what can be achieved with a stripy top and a napkin. 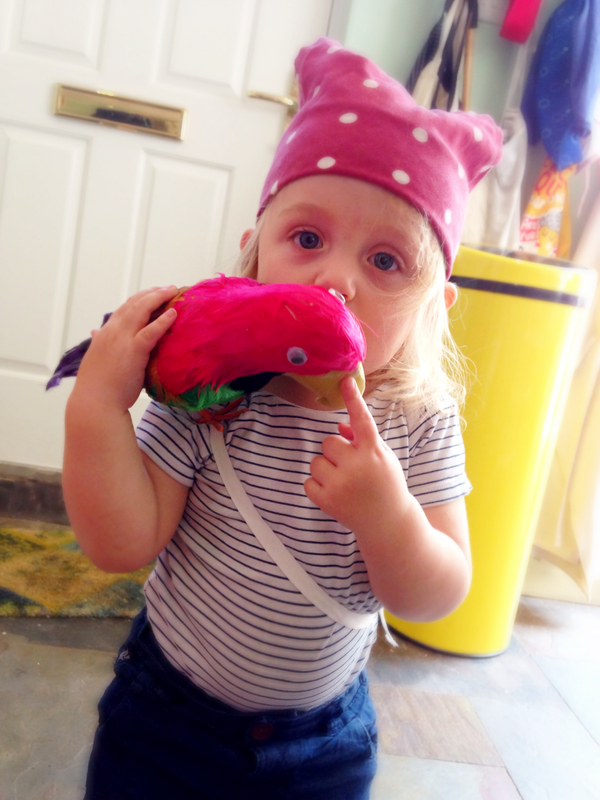 The parrot was actually one of Leigh’s birthday presents. We have a way to go before our efforts come close to some of the spectacular pirate outfits we saw in town, but it’s a start. 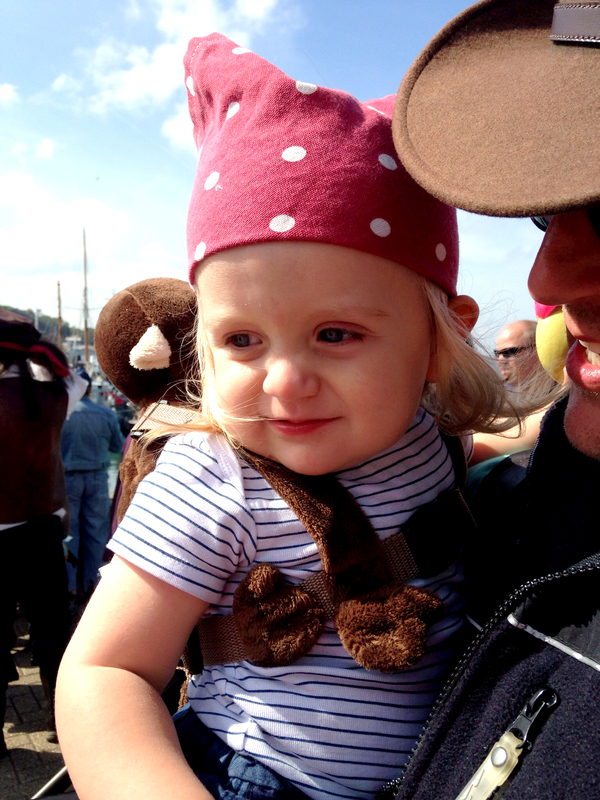 For Arthur’s animal companion we settled on a monkey backpack that handily converts to reins. I’m not generally a fan of the idea of keeping my son on a leash, but with the crowds around and him desperately to get in on the action it felt like a sensible safety line in case he managed to slip free of our hands – and particularly useful for gently edging him away from the lure of a springtime swim. The water was actually not as cold as we expected. It certainly won’t be long before we brave a dip, but I couldn’t quite pluck up the courage this weekend. 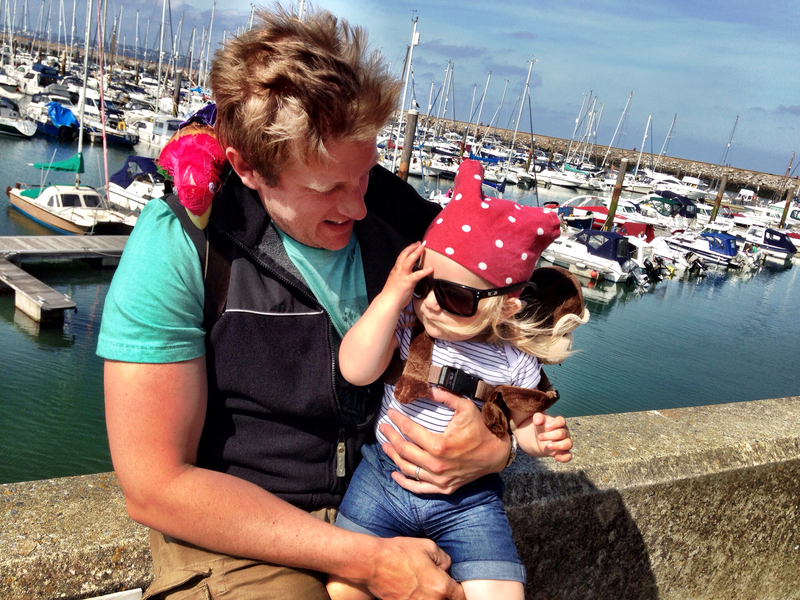 There was still a bit of a nip in the air, but the weather was generally gorgeous – definitely sunglasses territory, though Arthur seems to prefer his Dad’s to his own! 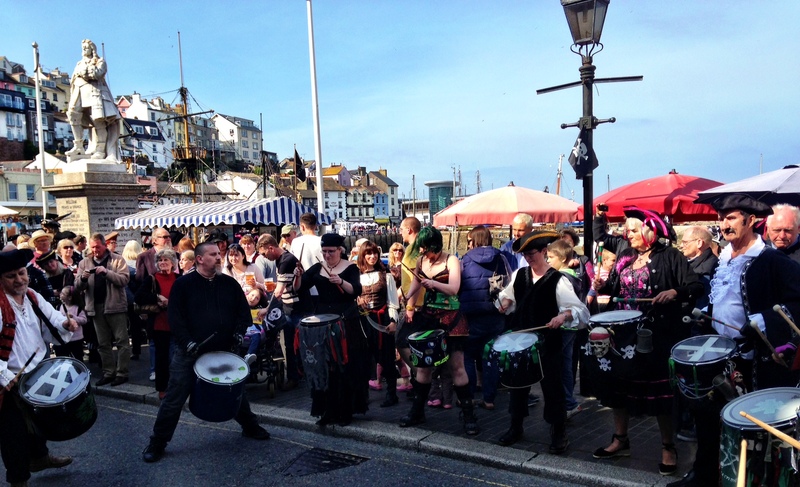 Brixham was absolutely buzzing – music echoing around the harbour bowl from the stage in the old fish market, performers taking over the streets and a mix of locals and tourists in some pretty impressive piratical attire. I think Arthur was a little confused about what was going on – quite understandable really as it certainly wasn’t your average Brixham weekend! But nonetheless he seemed to enjoy himself, watching transfixed as his town was transformed. It definitely managed to take his mind off his teeth which is no bad thing. 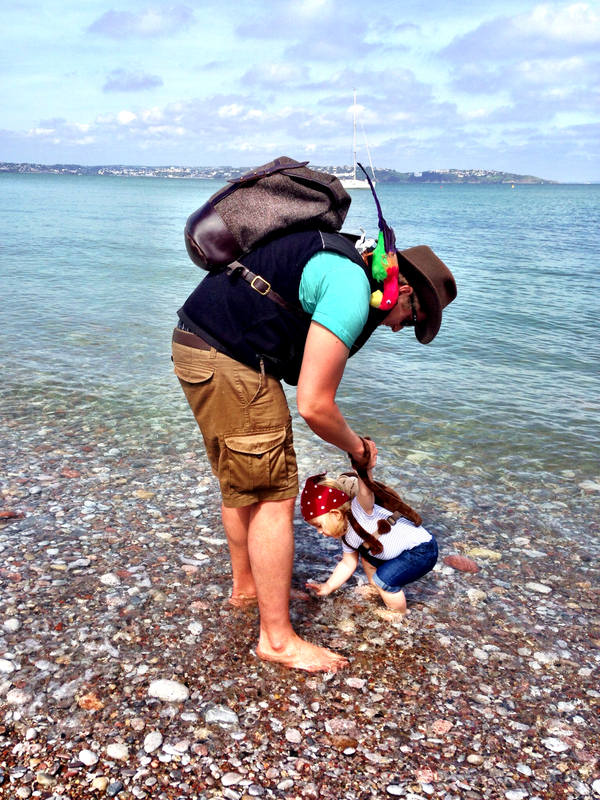 This entry was posted in Sophie is parenting, Sophie loves Brixham, Uncategorized and tagged brixham, fancy dress, pirate festival on May 5, 2014 by sophieblovett. It was quite a surreal day – but brilliant fun! I think the reins are going to come in very handy over the next few months – and Arthur seems to love wearing them! It was fab – can’t wait for next year!